WASHINGTON— A new analysis finds U.S. taxpayers have lost more than $1 billion over the past decade on a program that allows cows and sheep to graze on public land. Last year alone taxpayers lost $125 million in grazing subsidies on federal land. Had the federal government charged fees similar to grazing rates on non-irrigated private land, the program would have made $261 million a year on average rather than operate at a staggering loss, the analysis finds. 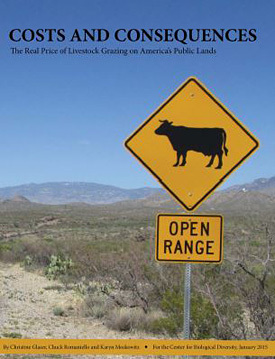 The study, Costs and Consequences: The Real Price of Livestock Grazing on America’s Public Lands, comes as the Obama administration prepares Friday to announce grazing fees for the upcoming year on 229 million acres of publicly owned land, most of it in the West. The report was prepared by economists on behalf of the Center for Biological Diversity. The gap between federal grazing fees and non-irrigated private land rates has widened considerably, according to the study. Bureau of Land Management and U.S. Forest Service grazing fees are $1.35 per month per animal unit (a cow and a calf), just 6.72 percent of what it would cost to graze livestock on private grazing lands. This is a marked decline from the federal fee being 23.79 percent of non-irrigated private rates when the federal fee first went into effect in 1981. There are about 800,000 livestock operators and cattle producers in the United States. Of those, fewer than 21,000 — or 2.7 percent of the nation’s total livestock operators — benefit from the Forest Service and BLM grazing programs in the West. The federal subsidy of the grazing program goes beyond the direct costs and fees. There are vast indirect costs to grazing on federal lands, including the government killing of native carnivores perceived as threats to livestock, wildfire suppression caused by invasive cheat grass facilitated by cattle grazing, and expenditure of U.S. Fish and Wildlife Service funds from protecting other species threatened by livestock grazing. “The full cost of the federal grazing program is long overdue for a complete analysis,” the study said. The Center for Biological Diversity is a national, nonprofit conservation organization with more than 800,000 members and online activists dedicated to the protection of endangered species and wild places.